COWAN SIGNS IS PROUD TO LAUNCH ITS NEW BLOG! Let The Cowan Signs Team, inspire you. 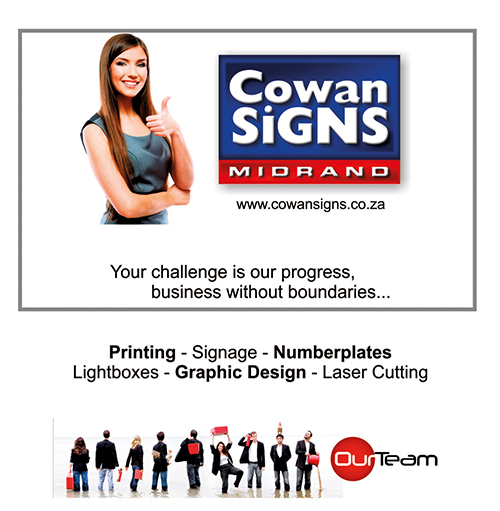 Visit Cowan Signs now and develop the image that your business needs. Here at Cowan Signs we are proud to announce our new venture into the blogging world. Our aim is to provide you with up to date information, tips and techniques for getting the best out of your signage requirements. Over 19 years in the industry, time and experience has allowed us to develop more understanding of what all our customers require when either deciding to get signage done for the first time or taking the leap of faith that is necessary to create your business image. Happy Mandela Day from Cowan Signs! Sand Blast Vinyl saving energy by reducing heat, filters UV rays, privacy and security. Website Designed & Developed by Cronje Design Co.
Disclaimer | Copyright © 2015 Cowan Signs. All rights reserved.